Do you remember? It was an unforgettable time. The kind that, in hindsight, you can say, “something really unique was happening then”. 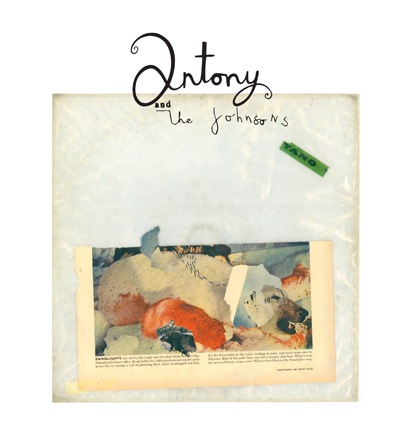 But the late 1970s was a time when people with very little, especially in New York City, were just making the best with what they had: each other, music, and a new type of portable sound system — the boombox. In Lyle Owerko’s new book The Boombox Project, the New York-based photographer intended to turn subject into art, and photograph his personal collection of radios. But once he started hearing stories about his topic, the outcome shifted dramatically. In this book, you are invited to listen in on some of the most iconic MCs, musicians, and artists of that generation, recollecting about life on the streets and how the boombox grew to be so much more than just another radio. Filmmaker Spike Lee starts the book off with a foreword about Joe Radio, the first guy he ever saw listening to a portable radio on the corner of his Brooklyn block. 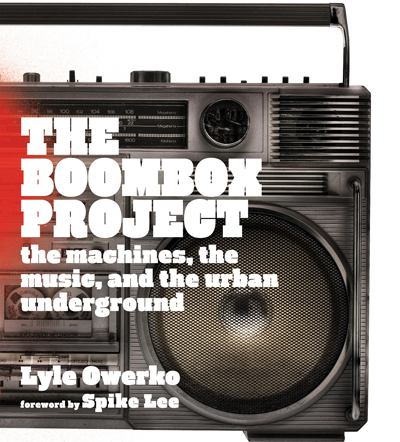 From there, Owerko reveals stories from the likes of LL Cool J, Fab 5 Freddy, Kool Moe Dee, and Rosie Perez about their first encounters and experiences with the boombox. All their memories share a common thread: community. Today, we hear so much about sharing online, whether it’s music files or social networking. But the true pioneers of electronic sharing came from the boombox generation. It was a time of great creative growth. All photography by Alfred Stieglitz. Courtesy of National Gallery of Art and Skira/Rizzoli. The word “ambitious” barely covers the life and work of Alfred Stieglitz. 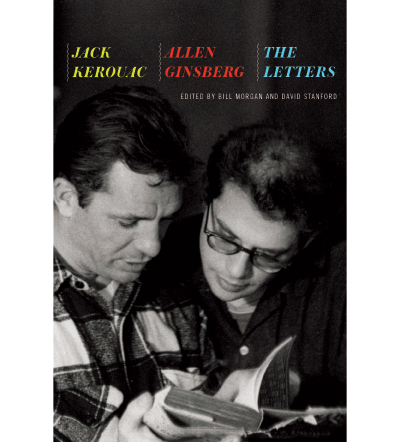 He was a photographer, a gallery owner, a magazine editor, and probably the man most responsible for bringing photography to the art world. Along the way, he also found time to marry a young Georgia O’Keefe and seal her reputation as a painter. As a photographer, Stieglitz experimented with many subjects, from New York street scenes to cloudscapes to sultry portraits of O’Keefe. Behind all of his images was the driving philosophy of “pictorialism”, a belief that photographs should look like paintings. His most celebrated image is The Steerage, a picture of poor immigrants on a steamship. 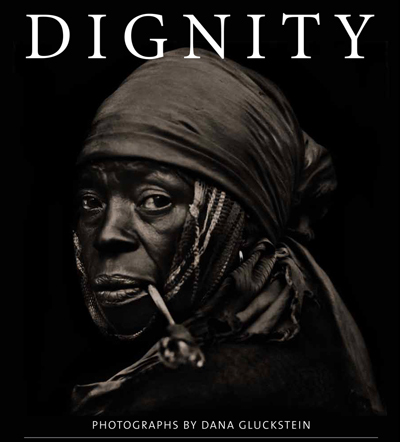 Where another photographer might have focused on faces and gestures, Stieglitz makes it a Cubist-like study of form and light. New York, and its teeming street life, was a subject Stieglitz returned to throughout his career. 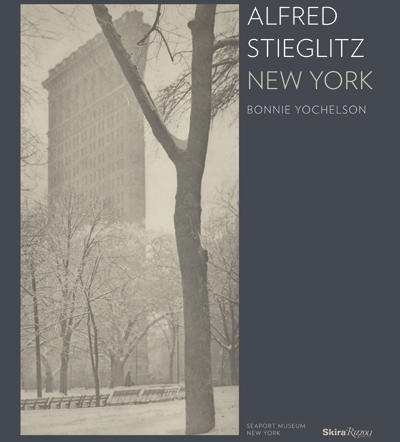 In Alfred Stieglitz New York, the city is shown over a period of five decades, but always filtered through Stieglitz’s unique personality. Beauty and desolation are given equal weight. As Georgia O’Keefe once said of her husband, it was as though “something hot, dark, and destructive was hitched to the highest, brightest star”. That old saying (and secret dictum of science fiction) “the future is now” is rarely as appropriate a descriptor as it is for William Gibson’s latest novel, Zero History (Putnam, $26.95). For the past twenty-five years, Gibson has been churning out, with a machinelike consistency, remarkable works of science fiction — all the while edging their settings backwards, closer and closer to the present. Having established himself as one of our finest dealers of far-flung futures, Gibson’s decision to set his first novels of the new century — Pattern Recognition (2003) and Spook Country (2007) — in a future barely distinguishable from the present came as something of a surprise. Gone were the razor girls, neural uplinks and dope-smoking Rastafarian spaceship pilots that had for so long characterized his work; in their stead were viral internet footage, transnational marketing conspiracies and something akin to a 9/11 induced cultural tinnitus, the nascent whine of the old rhythms of the world unfurrowing. All of a sudden, the future felt more like the now than ever before. 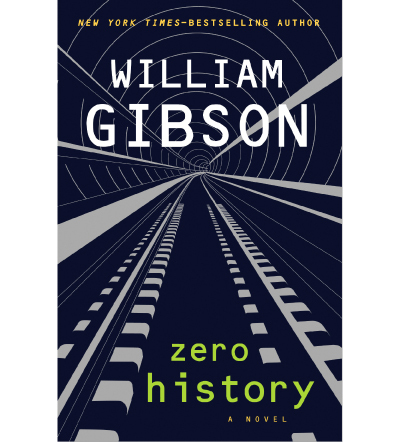 Zero History marks the third, and perhaps final, installment in Gibson’s newest series. The three novels share the same near future world, as well as many of its characters, preoccupations and flaws. Exterior view of Suite V from the plaza. 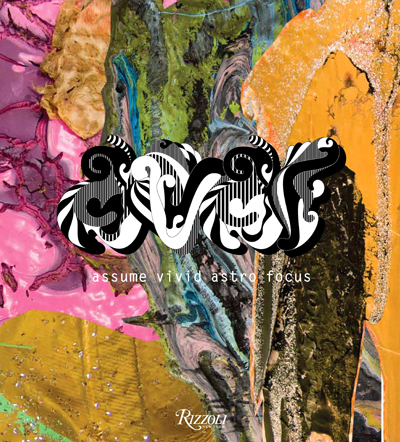 All photography by Iwan Baan. No other contemporary architect has a formal language as seductive and expressive as Zaha Hadid’s. Her work has sidestepped the conventional forms of modern architecture (rigid boxes and planes) for something altogether different (warped and tilted vectors) with complete assurance. 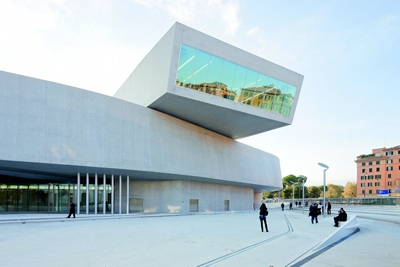 Hadid’s new museum for contemporary art in Rome, MAXXI: Zaha Hadid Architects. In addition to a portfolio of masterful photographs by Iwan Baan, the volume contains insightful essays about the building’s design and development, architectural plans, detail drawings, and construction photos. It’s eye-opening to understand the immense coordination efforts, and also the vast grid of steel reinforcing, that were required to get this building up. 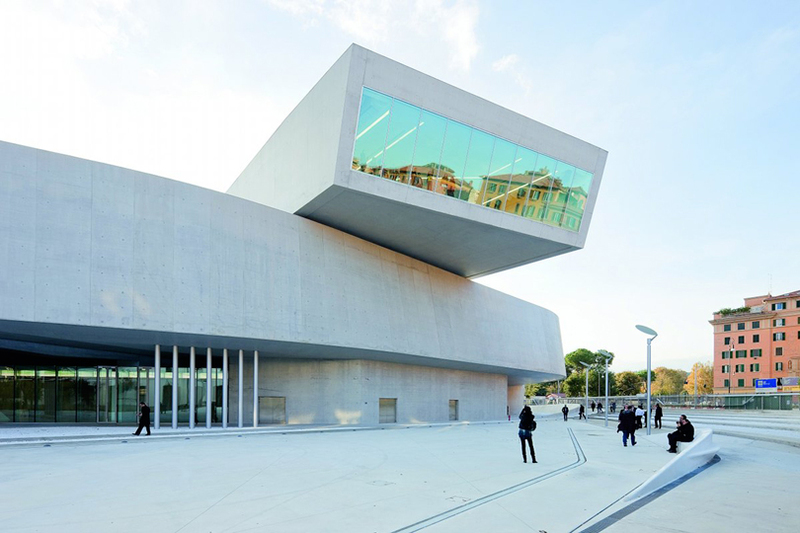 Since the project spanned from 1999, when Hadid’s office first won a design competition, to 2009, when construction was completed, MAXXI is a powerful summation of the ideas the architect explored during these fruitful years. Chief among them is the notion that buildings aren’t static constructions but complex, mutable entities that emerge from fields of energy and activity at a site. That idea is given full, clear expression at MAXXI. The building’s long curved walls follow the outline of the L-shaped site and retract and expand in response to adjacent street grids. The compressed, overlapping forms recreate the density of traditional Roman city blocks, and echo adjacent military barracks, train tracks, and the curve of the Tiber River. The structure looks strikingly contemporary and still sits comfortably within this very old city. To honor the fiftieth anniversary of Brasilia, Brazil’s modern capital city, we asked Rafael Schimidt, architect and Director of the Instituto de Arquitetos do Brasil, Departamento de Sao Paulo, to share his thoughts. 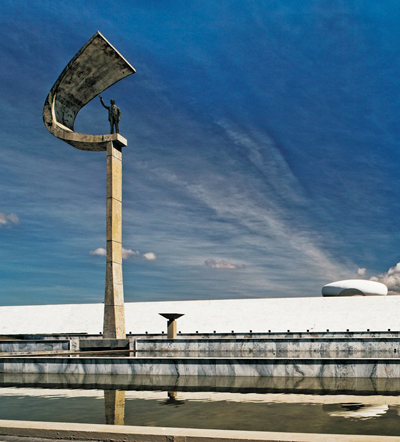 We’re also presenting photographs by Alan Weintraub from the impressive new monograph “Oscar Niemeyer: Buildings“. 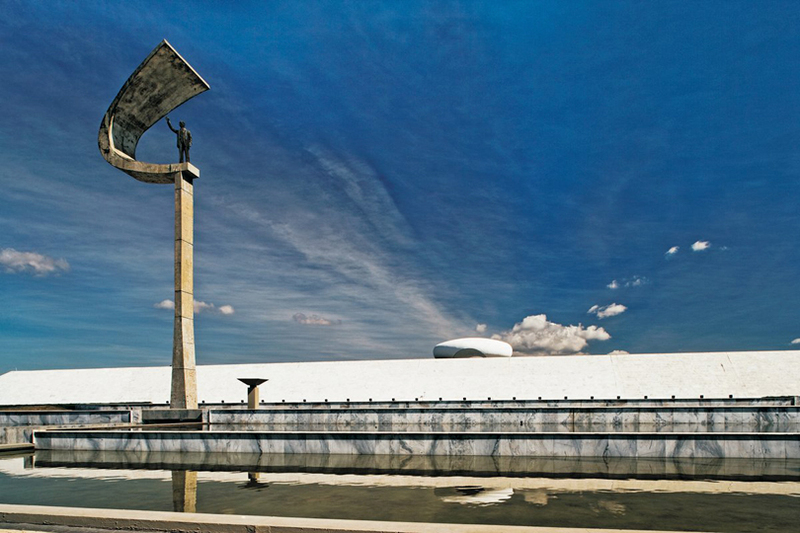 For a Brazilian, Brasilia brings to mind Oscar Niemeyer. 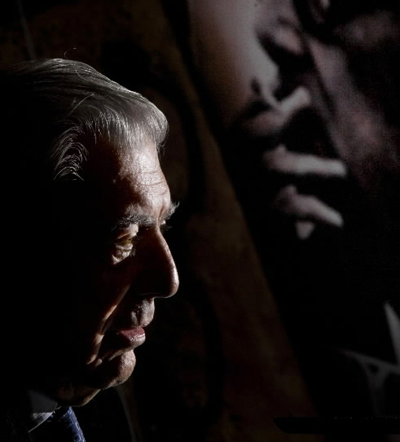 Lucio Costa and his role in planning the city remain practically unknown. The confusion comes from the fact that when someone visits or sees pictures of the place, what’s instantly perceived are the famous buildings created by Niemeyer, such as the Three Powers Plaza, the Ministries Offices, the Cathedral, or the Jucelino Kubitsheck Memorial, even though other great architects also designed fine buildings for the city. Brasilia is a postcard city that every Brazilian wants to visit at least once, and also an administrative capital, but not a place where anyone would specifically choose to live, spend free time, or work. And as the majority of Brazilian politicians seem to serve their own interests, Brasilia is seen by the population as a center of political corruption.